The ownership type shown on your deed represents the legal rights that the joint owners have within the property. A tenant by entirety deed allows the ownership interest of a deceased person to pass directly to the surviving tenants. The main benefit of a tenancy by entirety is that a tenant may not sell or convey his interest to another party without the consent of all tenants. If all of the tenants want to ensure that the interest of a deceased tenant automatically goes to the surviving tenants, all joint tenants will need to agree to change the joint tenant deed to a tenancy by entirety deed. Obtain a copy of the joint tenancy deed. Identify all joint tenants named as the "grantees." The grantees are the current legal owners of the property. All of the grantees named on the joint tenancy deed must agree to sign the tenancy by entirety deed in order to switch the ownership of the deed from joint tenancy to tenancy by the entirety. Complete a blank tenancy by entirety deed. Write in the full names and addresses of each joint tenant in the "grantor" section of the tenant by entirety deed. Write in the current address of each owner immediately after his name. All of the owners named as a grantee on the joint tenant deed will be named as both a grantor and a grantee on the tenancy by entirety deed. Write each tenant's name and address in the "grantee" section of the tenant by entirety deed. Write in the amount being paid for the property in the "consideration" section if the transfer involved an exchange of money. Write in the legal description of the property exactly as it appears on the joint tenancy deed. Hire an attorney to review the tenancy by entirety deed. The attorney will make sure the information is complete and accurate. If any errors are pointed out, do not make corrections to the deed, but execute a new deed so that it has no errors. A clean deed with no markings or scratched out words will prevent future confusion or misinterpretation. Sign your completed tenancy by entirety deed jointly. Each joint tenant is a grantor as well as a grantee on the tenant by entirety deed. Since the new deed is only converting the type of ownership from joint tenants to tenants by entirety, the individual owners stay exactly the same. Each joint tenant must sign his full name and address in the “grantor" section of the tenant by entirety deed. 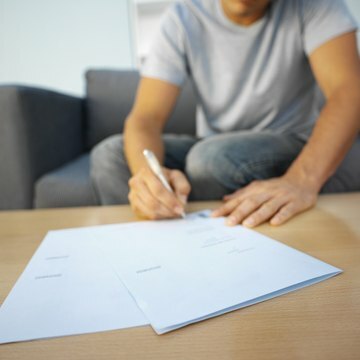 Write the phrase "as joint tenants" next to each grantor's signature. Each joint tenant must sign his full name and address again in the “grantee" section of the tenancy by entirety deed. 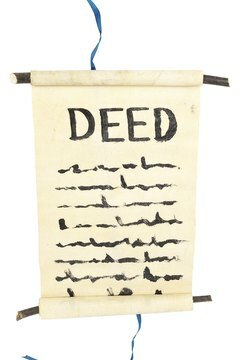 Write the phrase "as tenants by entirety" next to each grantee's signature. Make sure that all signatures are done in front of a Notary Public. 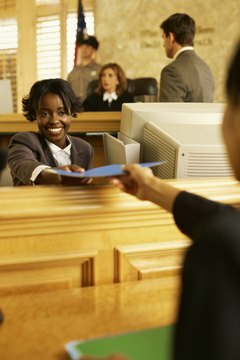 Record your new deed in your local register of deeds office, land records division or circuit court. Make copies of the recorded deed and provide a copy to all of the tenants. Once the deed is recorded, the ownership of the deed has been changed from joint tenancy to tenancy by entirety. 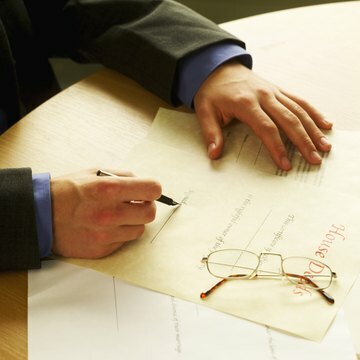 Only a few states that recognize a deed as a tenants by entirety agreement. In these states, you may be required to hold title as joint tenants. Only married couples can use a tenancy by entirety deed. Unmarried couples must enter into joint tenancies or become tenants in common. Some states require the sum of $1 be used if no money is being paid by the grantees for consideration. Check with the county recorder's office to determine the required amount for a transfer where no money is involved. When deeds are passed among spouses, no recording or transfer taxes are required, but a recording fee must still be paid. One of the legal benefits of holding title as tenants by entirety is that no creditor can attach a lien on the property for a debt that only one of the owners owe. This is because each owner owns an "undivided" one-half interest in the property.